Their native range is tropical Africa, Southeastern Asia and parts of Malaysia. Plant in Spring after danger of frost has passed. 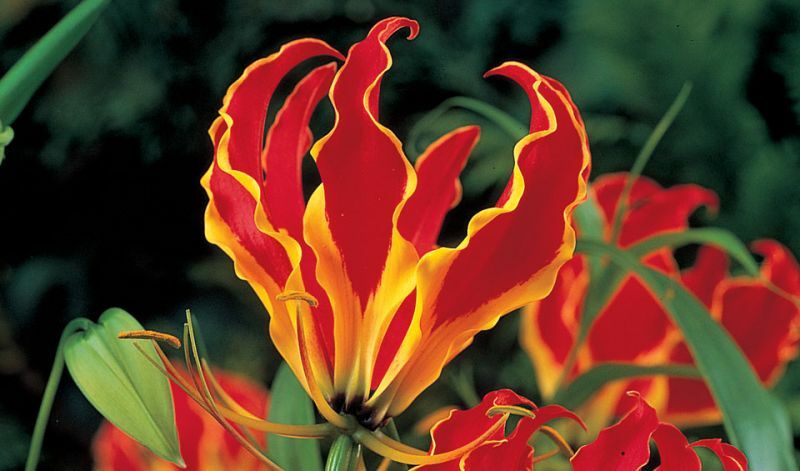 Gloriosa prefer to have its roots cool and shaded, the foliage in the sun and a sandy type soil. Place the odd-shaped tubers horizontally in the soil. Water well until shoots appear, then keep soil moist but not soggy. With the help of a trellis, obelisk, arbor, pergola or fence these plants can climb up to 6 ft / 180 cm. 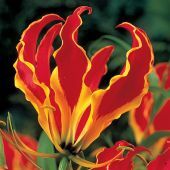 Grow them in a spot where the twining vines and brilliant spidery blossoms can be seen at close range and from multiple angles. Very suitable to grow in deep pots or containers (at least 8" / 20 cm in diameter) or even as house plants: place them in indirect light and keep soil evenly moist. Once it begins to grow move it into more sun and increase watering. For best performance try to keep the temperatures below 70F / 21C.